View cart “Photo Shake” has been added to your cart. Photo: Layers is a photo/video slideshow theme package created for use in Final Cut Pro X. With Pixel Film Studios theme packages, editors can create a video from start to finish with absolute ease. 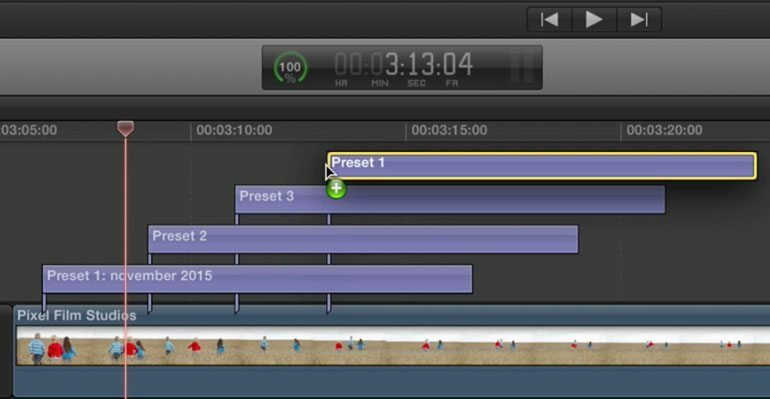 Mix and match using easily customizable slideshow presets and place them on top of footage in the FCPX timeline. Stack title layers in the timeline to create a transitional slideshow effect. Photo: Layers includes an absolutely limitless variety of animation options throughout 3 easy-to-use presets, and a prismatic overlay for enhancing designs. Produce a professional video without the use of keyframes with Pixel Film Studios theme packages. Photo: Layers features custom slideshow presets and an endless amount of slideshow animation possibilities so that users can edit from any angle. Presets titles are immediately ready for use, but can also be customized to achieve a variety of unique designs. Adjust rotations and scales of the 1 to 3 revealing layers, text positions, colors, and more to create new and unique looks. 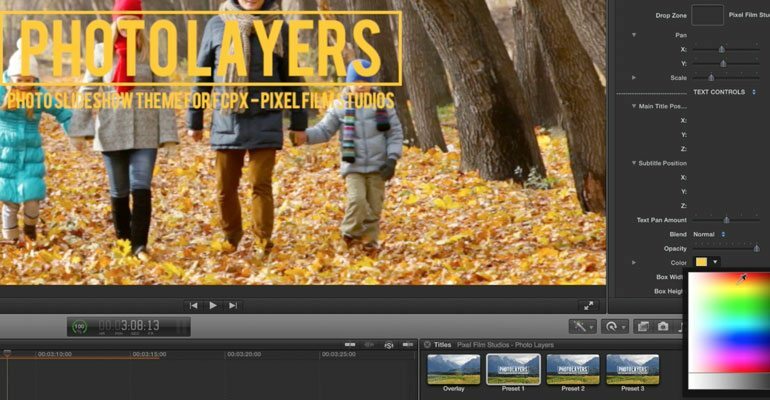 Pixel Film Studios theme packages are completely customizable in FCPX. 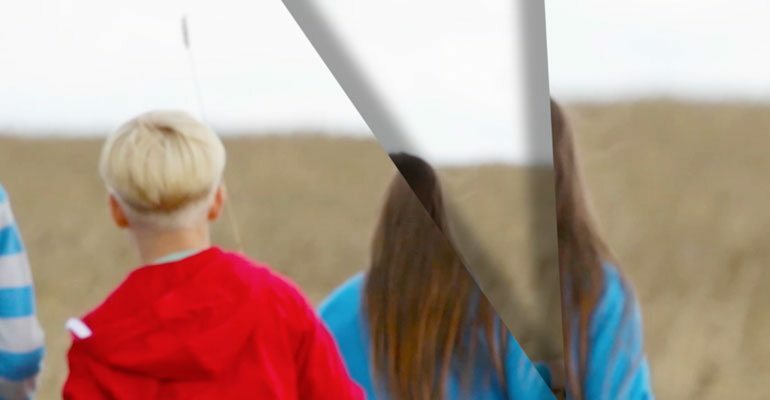 With the swab of the color wheel and quick slider adjustments, video editors can achieve an entirely new look or feel. Change the layer effects, shadow stylization and make adjustments to the revealing layers. Then control text placement to complete the look. Get creative with Pixel Film Studios’ themes. Photo: Layers’ slideshow presets are designed as title layers and as such work great for introductions. Utilize title elements to indicate the start of a new section or introduce characters/settings in any video production. Top scenes off with Photo: Layer’s prismatic flare overlay for additional style. Photo: Layers is extremely easy to use in Final Cut Pro X. Browse through the FCPX titles menu and insert a desired animation preset into the FCPX timeline. Make sure to overlap title layers so that they transition from one slide to the next. Then, navigate to the Inspector window of said title layer and insert personal pictures or videos into the drop zone. Lastly alter the text and change the style using the controls provided in the inspector window. Photo: Layers will do the rest. Learn how to easily customize slideshow presets with the Photo: Layers Lesson. First select your media in the FCPX library and dragging it to the timeline. After that locate Photo: Layers in the titles library and drag it above your media. Once you have your timeline set up, Let’s start using Photo: Layers Go to the Inspector Window. First you have your camera controls. Here you can choose how you want your media move. By checking the Handheld box you are choosing to go for a movement that has no set direction. The Dolly Amount slider allows you to control how much you zoom into your media. Next let’s adjust our Style Controls In this section you can adjust the opacity, blur and distance of the line that separates your layers. By using the rotation slider you can choose what angle you want your media to appear. After we adjust our Style Controls we can begin customizing our layers. Depending on how many title presets you use will determine how many layer controls you have. Each Preset has a different animation but you can control them all the same by using the Scale and Rotation sliders. 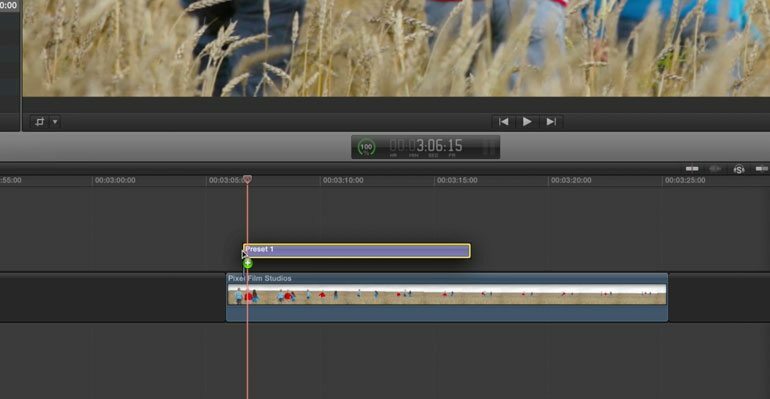 Fill the drop zone box with the media you so choose from the FCPX Library and drag it into the timeline. 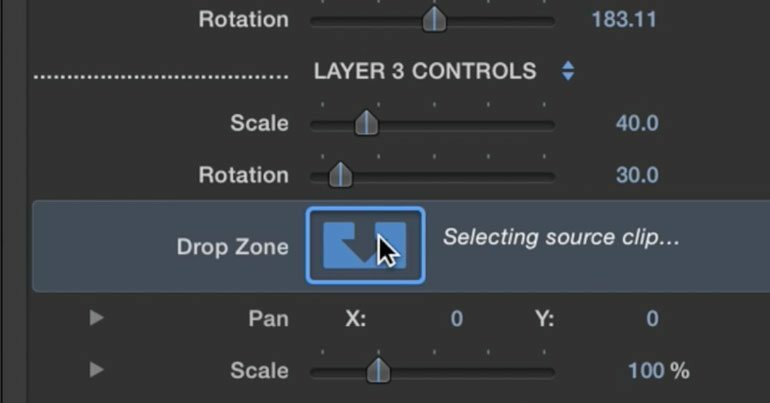 Click the Drop zone box under the rotation slider in the Layer Controls, It will turn blue. After that click your media in the timeline and hit apply clip in the bottom right corner of the viewer window. You can control the position and size of your media by using the pan and scale sliders. Once our style and layer controls are set up we can move on to the Text Controls Here you can control the position of your Main title and subtitle. You can choose a blend mode and color to give your text a unique look. Lastly you have three sliders that adjust the box width, height and length so you can fit all your text no matter how big or small. To really use this effect to its full advantage place numerous photo layer presets on your media and rearrange them to make something viewers won’t forget. Where do I find Photo: Layers? Once the installation is complete, you can find Photo: Layers in the FCPX Title library.